After a run of Middle Eastern restaurants over the last few weekends we wonder why on earth we haven't got into it sooner. Years sooner. Well there's a couple of reasons. Firstly, it tastes too good. Every time we eat Middle Eastern food we gouge on meat, bread and rice until we're Mr. Creosote full. We're learning to counter our inner-piggies by bringing our own doggie bags so we can make a snap decision to stop eating and bag up before we can say "just one more little bite". Next time we'll try portioning out the bread and rice before we start eating, otherwise it's so easy to overdo it, the brain doesn't register that the stomach is full until way too late. 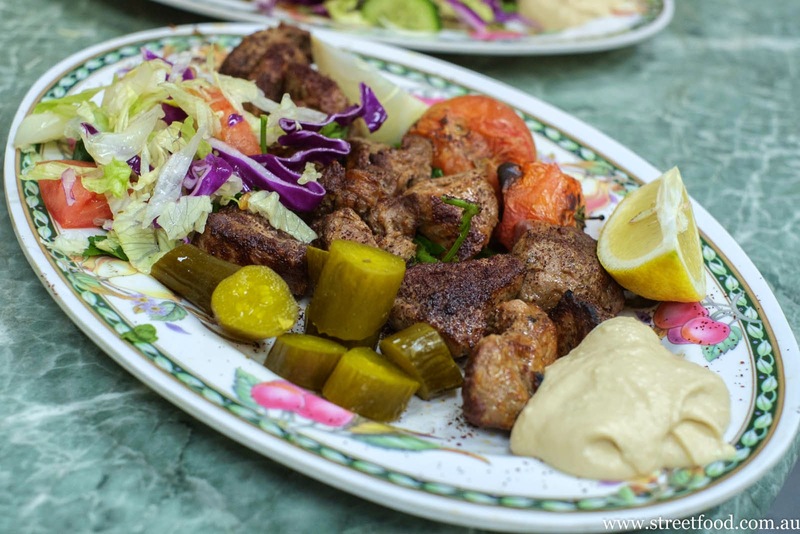 The second reason for our slow uptake on Middle Eastern food is that we thought that most Middle Eastern restaurants did pretty much the same thing: grilled meat on sticks. This is true to a point, but there's often also soup, stew, rice, salad and even pasta on the menu. And the grills\kebabs themselves differ from restaurant to restaurant with the varying cultures and cuisines. 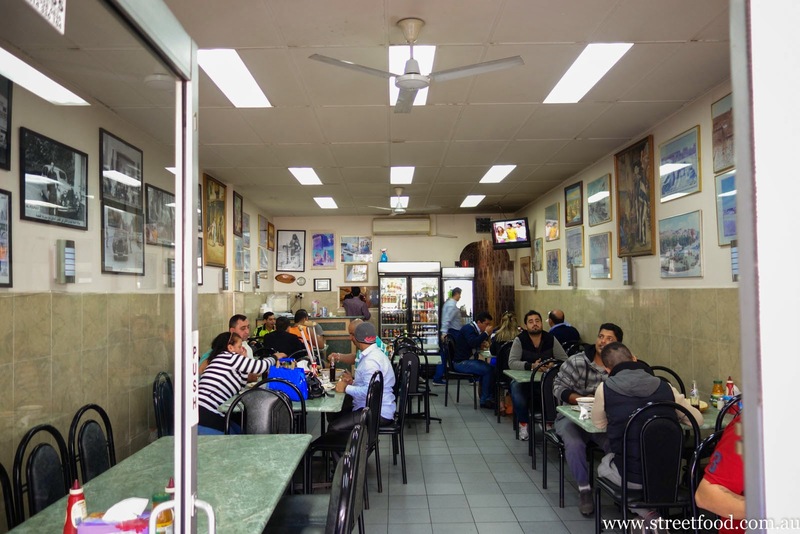 We dig the Afghani mini lamb chops in Merrylands, the Turkish Adanas in Auburn, and the sublime Iraqi tika in Fairfield. There's so much exploring to do. Anyhoo, one look at Al-Diaffah Al-Iraqi and we know we're in for something good. It's a your basic hole-in-the-wall and it's busy. The waiter blokes are friendly and accustomed to serving non-regulars, it's an easy place to eat. 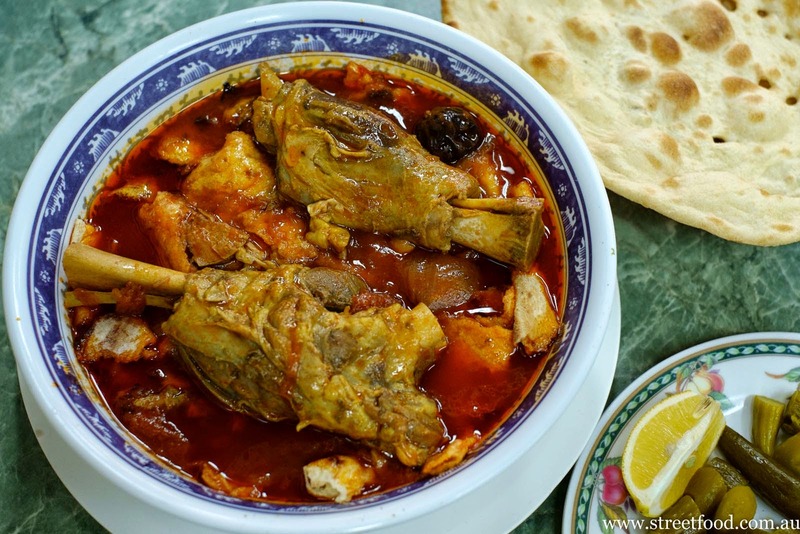 We love trying a cuisine for the first time, it's the dishes we've never heard of we always want to order. 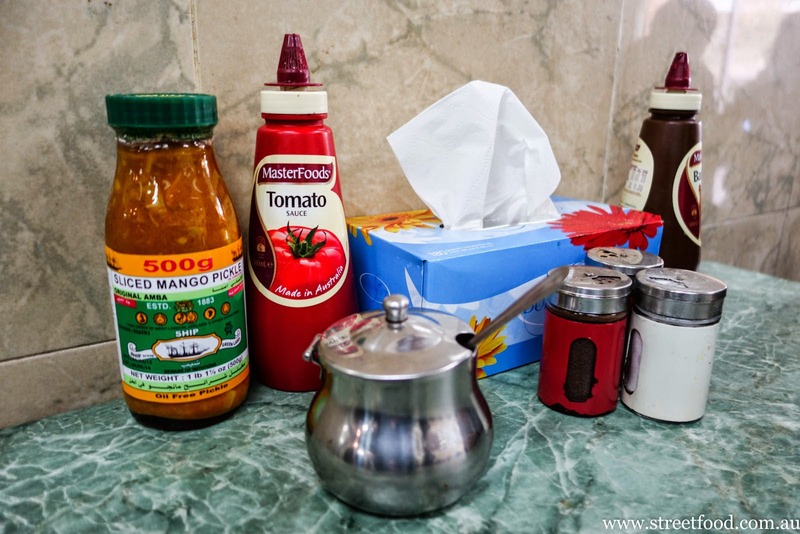 Dig the Aussie-Iraqi-Indian condiment setup: there's good old tomato and bbq sauce, salt and pepper, sumac and mango pickle. 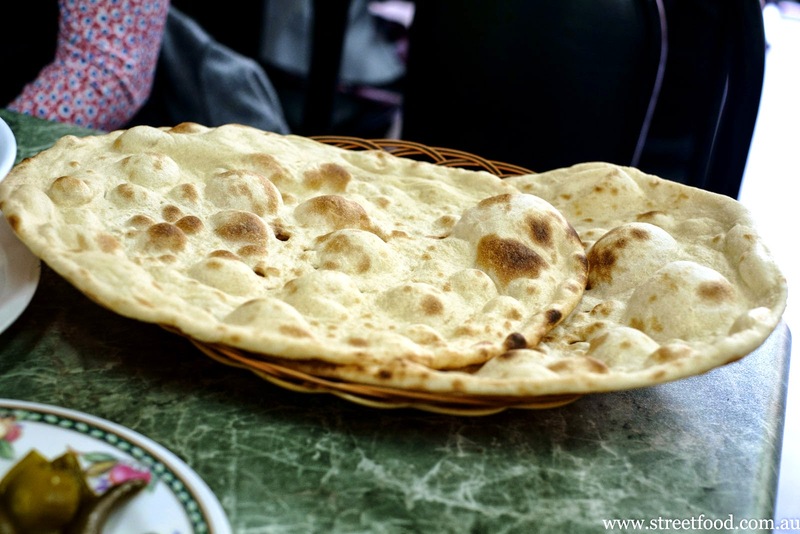 Flat bread arrives first, it's cooked fresh to order. Alison goes nuts over the pickles. There's a heavier flavour to them, not too sweet and not too salty. Bread/curry stew - $15. A couple of lamb hunks in what we guess is a tomato based sauce, given extra levels of flavour with some oil and pickled lemons. 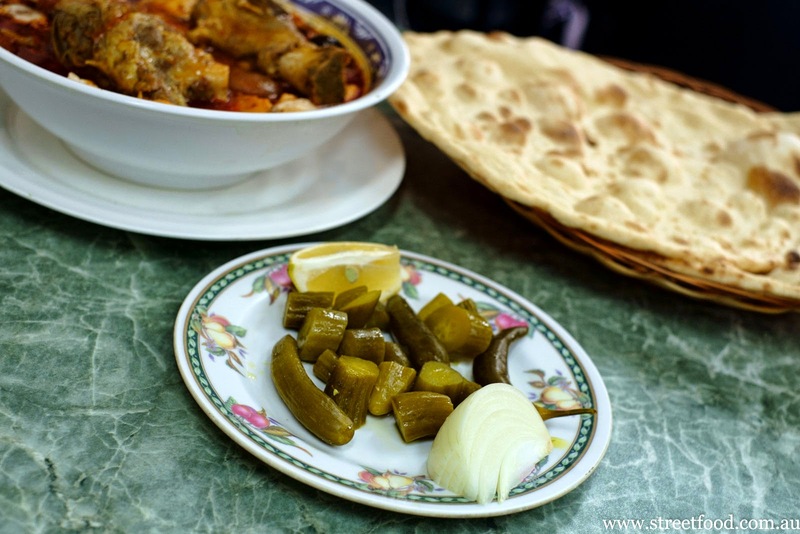 At first we thought the idea was to dip the flat bread in the stew. Then we discovered layers of bread underneath the lamb. The lamb falls off the bone with the raise of an eyebrow. The bread soaks up the sauce and becomes similar to lasagna in texture. 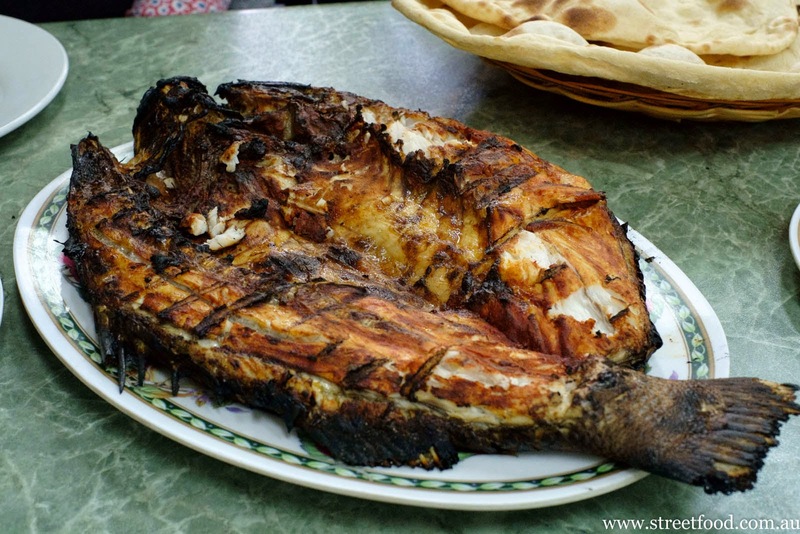 BBQ Parmandi fish (small) - $15. 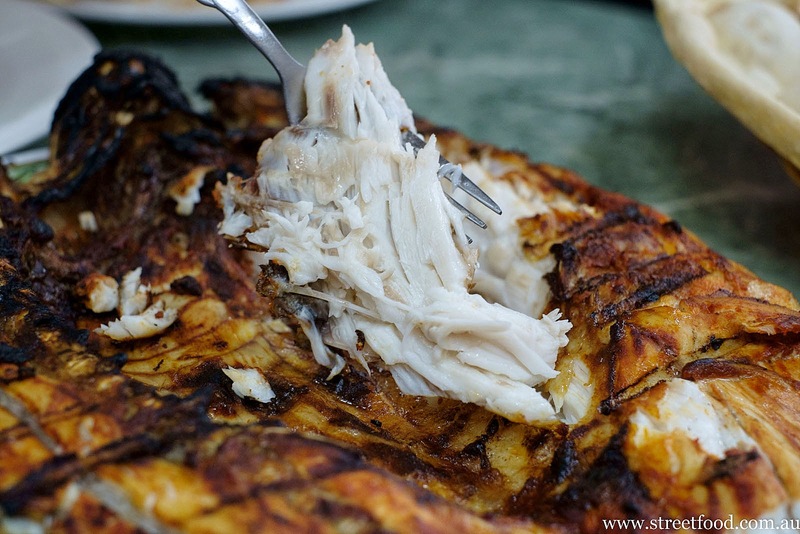 We wonder if Parmandi translates as Barramundi? 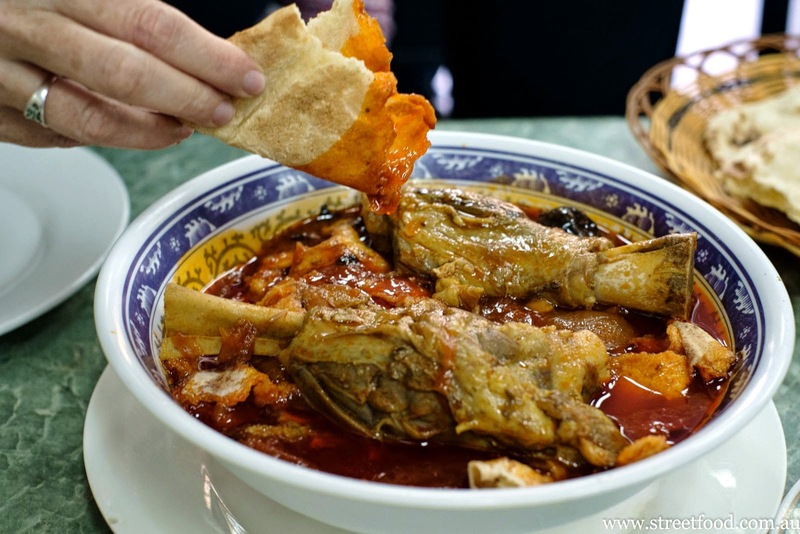 It has those muddy river flavours, similar to the fish popular in Chinatown food courts (species: fishus foodcourtus). It's lovely and blackened on the outside and flattened like a Portuguese chook so you can get too all the flesh at once. The first mouthful was'wow' but it didn't seem so exciting a couple bites later, maybe it was overpowered by the curry stew. There's plenty of moist white flesh underneath the blackened skin. Rice and fasolia - $8. 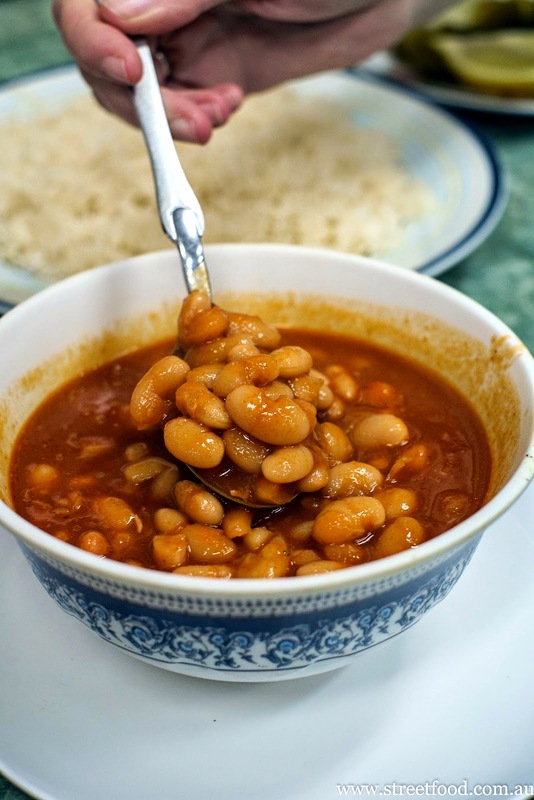 This tastes very much like homemade baked beans in tomato sauce. There's much more flavour depth than in a can of Heinz, they'd charge $18 for this in Surry Hills. It comes with a large plate of white long, long grain rice. We couldn't finish this so we doggy bagged it - it was the perfect light dinner after a heavy lunch. Tika - $15. 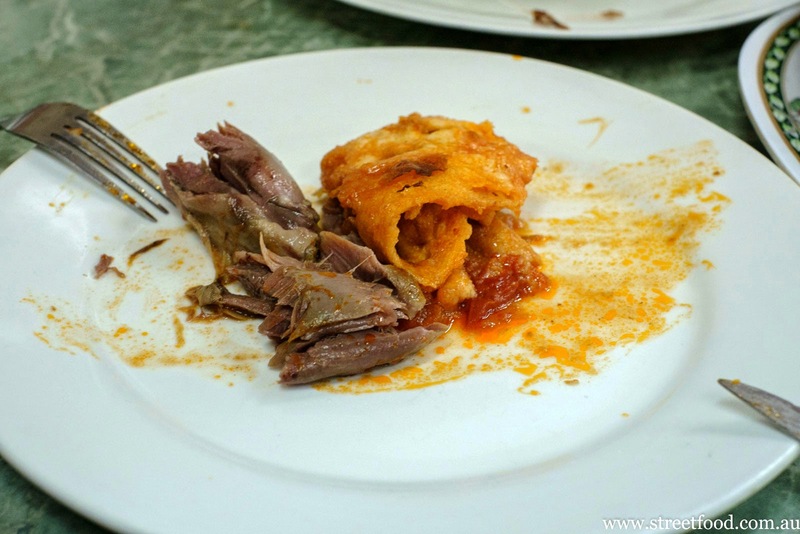 Chunks of bbq lamb. We're not talking old mutton, this is seriously good lamb, probably backstrap, perfectly cooked and seasoned. Man, these guys seriously know how to grill some protein. The only other time Shawn remembers enjoying a hunk of red meat this much was at Aqua Dining ten years ago. 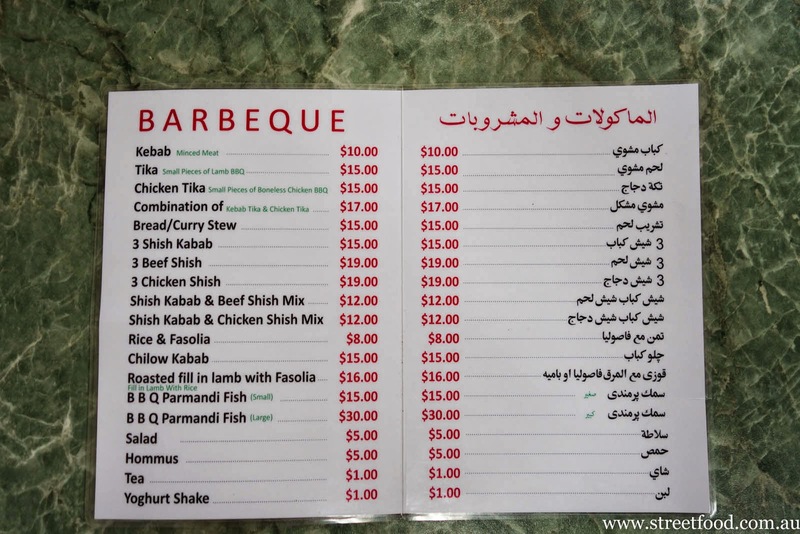 Kebab - $10. 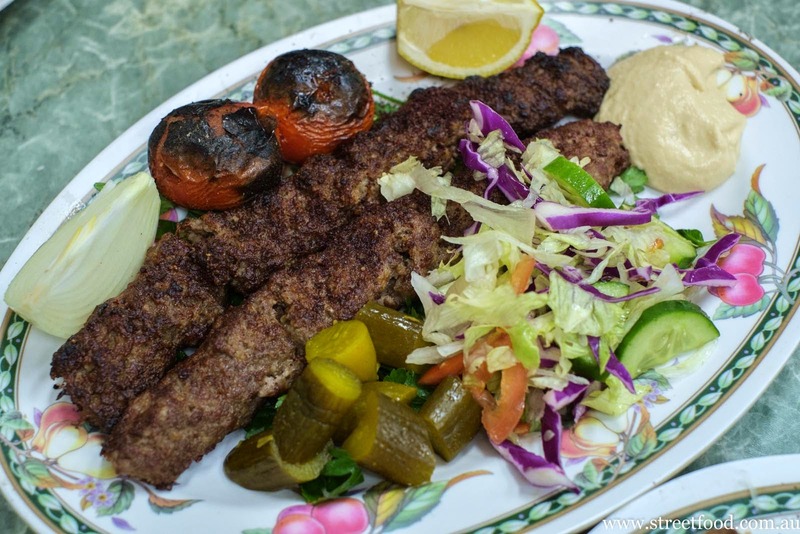 Two perfectly cooked kebabs of mince and onion, aka Iraqi rissoles, with salad, pickles and bread. This has to be one of the best value meals in Sydney. 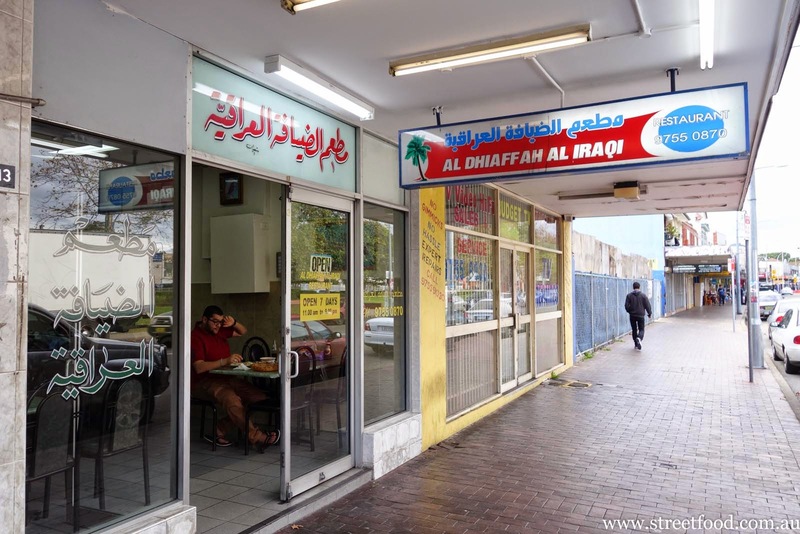 Al Dhiaffah Al Iraqi is at 13 The Crescent Fairfield NSW 2165. Phone (02) 9755 0870. Few months ago my coworker recommended we check out Fairfield for food so we drove all the way from Manly. Couldn't decide where to eat so we left. Grrrrrr. I guess we'll have to drive to Fairfield again but this time we know where to go. Thanks! It is really hard to know where to go when you get to a suburb you have never been to before. It's even harder when there is so much choice. Hope you get back, Saturday seems to have more places open in the day that Sunday.